Third-hand smoke is a term that’s been coined to define yet another potential hazard of smoking. In addition to the risks associated with smoking (defined as first-hand smoke), and the dangers of secondhand smoke, the less visible concern of third-hand smoke may pose a threat as well. What is this new cause for concern? Third-hand smoke is a term used to describe the particles and gases that are left over after a cigarette is extinguished. These particles land and remain on virtually any surface in an area where someone has smoked — on clothes, in hair, on furniture, and on flooring. It might seem obvious that substances left over after a cigarette is put out could be dangerous. After all, the list of additives in cigarettes is frankly terrifying to someone with a background in chemistry. But there is more than one mechanism by which third-hand smoke causes problems. The first route is easiest to understand. Chemicals that are left over after smoking land on any surface in an area where smoking has taken place. 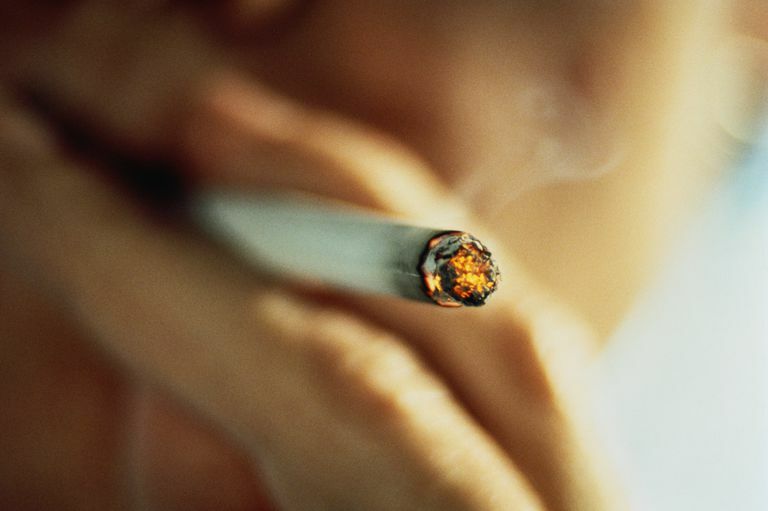 Studies have found that of chemicals in third-hand smoke, 11 are carcinogens (substances capable of causing cancer). A few of the chemicals that have been found on surfaces after smoking include nicotine, cyanide, radioactive polonium-210, lead, arsenic, polycyclic aromatic hydrocarbons, and butane. A second way that toxins can be of concern with third-hand smoke is through a process called “off-gassing." Off-gassing occurs when substances from smoke that have been deposited on surfaces, such as nicotine, are released back into the air as gases. Through this process, tobacco residue that has built up on surfaces continues to emit toxins long after smoking has occurred. When THS reacts with nitrous oxide (for example from gas appliances or car engines) in the air creating carcinogens known as nitrosamines. When volatile organic compounds (VOCs) in THS react with ozone in the air to create formaldehyde among other chemicals. People can be affected by the toxins in THS by inhaling them (either particles or gases that are emitted), by ingesting them (when particles land on food, or on fingers that are then placed in the mouth such as with infants), or by absorption through the skin. Of note is that skin absorption, though not often talked about, is not uncommon. In this day and age when we have patches for nicotine, hormones, and other medications, it's clear that our skin is not a solid barrier to substances in our environment. It is too early since the discovery of third-hand smoke to accurately quantify the risks. Considering that the U.S. Surgeon General states that there is no risk-free level of secondhand smoke, it sounds wise to say that any exposure to third-hand smoke should be avoided as well. Unlike secondhand smoke, the risk of third-hand smoke can actually increase over time as more toxins are deposited on surfaces in a home or vehicle. Thirdhand smoke (THS) was found to interfere with the healing of wounds, and also "wound elasticity" — in other words, how rapidly a wound will heal and what kind of scar will be formed. There is early evidence that THS may raise the risk of cancer. Nitrosamines — chemicals found in THS — above the limits recommended by the Environmental Protection Agency for children aged 1 to 6 are found in 77 percent of homes which have smokers. This is thought to translate into 1 case of cancer for every 1000 people. It's important to note, however, that this research is still very young, and most chemicals in thirdhand smoke have not yet been studied in this manner. THS exposure in mice can result in fatty liver disease, which in turn may lead to cirrhosis and heart disease. Thirdhand smoke exposure may result in biological changes in cells that predispose to fibrosis, which raises concern that it may play a role in COPD and asthma. Changes in how platelets combine due to THS raises concern that THS may increase the risk of blood clots and heart disease. THS exposure in mice results in hyperactivity, and there is concern that prolonged exposure in children could result in more serious neurological conditions. It is thought that children are likely at greater risk than adults. The carcinogens in dust tend to settle to the floor — where children are sitting and playing. Children are also more likely to put their fingers to their mouths after touching surfaces contaminated by THS. A high humidity level is protective to some degree, so regions, where humidity is low, would likely carry a greater risk of exposure. Ozone in the air also varies. For example, the reaction of volatile organic hydrocarbons in THS with ozone in the air would be of greater concern in an airplane, than say a vehicle on the ground. The best way to avoid third-hand smoke is to have a zero tolerance policy for smoking in your home and in your vehicle. Unlike secondhand smoke, ventilation does little to remove THS, and once third-hand smoke is there, you may not even know it. Unlike the old adage; time doesn’t heal when it comes to third-hand smoke. The fact that THS lingers on is evident if you’ve ever stayed in a hotel that once-upon-a-time allowed smoking. Even if it’s been smoke-free for a decade, those with bloodhound noses can still catch whiffs of days when the rules were different. And studies have confirmed this as well. Swabs taken from homes in which smoking has taken place still have measurable levels of THS after being left vacant for 2 months. Shower, washing your hair and skin if you’ve been exposed to THS. When possible, clean surfaces and materials exposed to smoke with vinegar. Keep in mind that this is not always practical, and may permanently stain and discolor certain fabrics and surfaces. If you choose to allow smoking in your home, open windows and try to discourage smoking in rooms that have carpeting. That said, with central heating or central air the contaminants will still be circulated throughout your home. Educate your friends and family. Studies that have looked at the beliefs of people surrounding smoking have found that if smokers realize that their smoking (via secondhand or third-hand smoke) affects others, they are more likely to enforce a household smoking ban. Removing THS is tougher than it sounds. Washing or dry cleaning alone may not cut it. In order for a cleaner to remove nicotine, it must be acidic. Yet most soaps are alkaline (the opposite of acidic) and fail to remove nicotine even from smooth surfaces. Using an acidic solution such as vinegar may remove THS from surfaces such as marble, but is not always practical. Most people don’t want their comfy couches smelling like vinegar. For the same reason, removing THS from carpeting is virtually impossible. If you wish to remove third-hand smoke from your home, replacing carpeting, though pricey, is likely the best option. Quitting smoking is the best way to avoid third-hand smoke. Adhami, N., Starck, S., Flores, C., and M. Martins Green. A Health Threat to Bystanders Living in the Homes of Smokers: How Smoke Toxins Deposited on Surfaces Can Cause Insulin Resistance. PLoS One. 2016. 11(3):e0149510. Dhall, S., Alamat, R., Castro, A. et al. Tobacco Toxins Deposited on Surfaces (Third Hand Smoke) Impair Wound Healing. Clinical Science. 2016 Apr 28. (Epub ahead of print). Dreyfuss, J. Thirdhand Smoke Identified as Potent, Enduring Carcinogen. CA: A Cancer Journal for Clinicians. 2010. 60(4):203-204. Karim, Z., Alshbool, F., Vemana, H. et al. Third-hand Smoke: Impact on Hemostastis and Thrombogenesis. Journal of Cardiovsascular Pharmacology. 2015. 66(2):177-82. Martins-Green, M., Adhami, N., Frankos, M. et al. Cigarette smoke toxins deposited on surfaces: implications for human health. PLoS One. 2014. 9(1):e86391. Matt, G. et al. Households contaminated by environmental tobacco smoke: sources of infant exposures. Tobacco Control. 2004. 13(1):29-37. Matt, G. et al. Residual tobacco smoke pollution in used cars for sale: air, dust, and surfaces. Nicotine and Tobacco Research. 2008. 10(9):1467-75. Matt, G. et al. Thirdhand tobacco smoke: emerging evidence and arguments for a multidisciplinary research agenda. Environmental Health Perspectives. 2011. 119(9):1218-26. Matt, G. et al. When smokers move out and non-smokers move in: residential thirdhand smoke pollution and exposure. Tobacco Control. 20(1):e1. Petrick, L., Svidovsky, A., and Y. Dubowski. Thirdhand smoke: heterogeneous oxidation of nicotine and secondary aerosol formation in the indoor environment. Environmental Science and Technology. 2011. 45(1):328-33. Ramirez, M., Ozel, M., Lewis, A. et al. Exposure to nitrosamines in thirdhand tobacco smoke increases cancer risk in non-smokers. Environment International. 2014. 71:139-47. Schick, S. et al. Thirdhand cigaretter smoke in an experimental chamber: evidence of surface deposition of nicotine, nitrosamines and polycyclic aromatic hydrocarbons and de novo formation of NNK. Tobacco Control. 2013 May 28. (Epub ahead of print). Sleiman, M. et al. Formation of carcinogens indoors by surface-mediated reactions of nicotine with nitrous acid, leading to potential thirdhand smoke hazards. Proceedings of the National Academy of Sciences of the United States of America. 2010. 107(15):6571-81. Tillett, T. Thirdhand Smoke in Review: Research Needs and Recommendations. Environmental Health Perspectives. 2011. 119(9): a399. Winickoff, J. et al. Beliefs About the Health Effects of “Thirdhand” Smoke and Home Smoking Bans. Pediatrics. 2009. 123(1):e74-479.